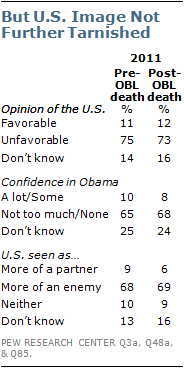 Most Pakistanis disapprove of the U.S. military operation that killed Osama bin Laden, and although the al Qaeda leader has not been well-liked in recent years, a majority of Pakistanis describe his death as a bad thing. Only 14% say it is a good thing. Moreover, many Pakistanis believe the U.S. raid on bin Laden’s compound – which was located about 35 miles from Islamabad – will have a negative impact on the already strained relations between the U.S. and their country. However, the current survey, taken after the raid, showed no material change in opinion of the U.S., when compared with polling conducted immediately before it. In fact, prior to the raid favorable ratings of the U.S. had already fallen to a level not seen since 2002, following the invasion of neighboring Afghanistan. Currently, just 12% express a positive view of the U.S. and only 8% have confidence in President Barack Obama to do the right thing in world affairs. Obama’s ratings are as low as former President George W. Bush’s were in 2008. Most Pakistanis see the U.S. as an enemy, consider it a potential military threat, and oppose American-led anti-terrorism efforts. All of these views were comparably negative both before and after the killing of bin Laden. Pakistanis are uncertain about their own government’s role in the military operation that killed bin Laden. About three-in-ten (29%) believe the Pakistani government authorized the raid and 23% say it did not, but 49% say they do not know. Only 18% think the government knew bin Laden was hiding in Abbottabad and 29% do not think that was the case; again, roughly half (53%) offer no opinion. Support for the Pakistani government’s military campaign against extremist groups has waned in recent years. Just 37% support using the Pakistani army to fight extremists in the country’s Federally Administered Tribal Areas (FATA) and the Khyber Pakhtunkhwa region (formerly the North-West Frontier Province). This level is significantly lower than it was two years ago, when, in a survey taken following conflict between government forces and Taliban-affiliated groups in the Swat Valley area, 53% endorsed using the army to battle these organizations. 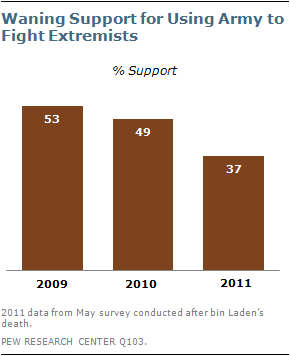 Similarly, fears that extremists might take over Pakistan have declined since 2009. Currently, 55% are very or somewhat worried about this possibility – still a sizeable number, but substantially lower than the 69% expressing such concern two years ago. While concerns about an extremist takeover and support for using military force against extremist groups may be slipping, the groups themselves remain widely unpopular. 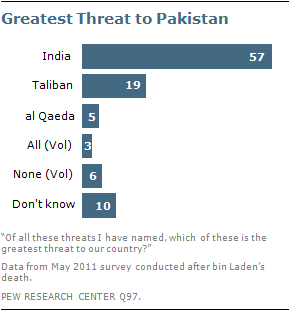 Just 12% of Pakistanis have a positive view of al Qaeda, down from 18% in 2010. Only 12% give the Taliban a favorable rating, and when asked more specifically about the Tehrik-i-Taliban (which is based in Pakistan) and the Afghan Taliban, Pakistanis give both groups similarly low levels of support. There is somewhat more support for Lashkar-e-Taiba, a Kashmir-based group that has carried out numerous attacks against India. Currently, 27% have a positive opinion of the organization. These are among the key findings from two face-to-face personal interview surveys conducted in Pakistan by the Pew Research Center’s Global Attitudes Project. The first was conducted April 10-26 among 1,970 Pakistanis as part of the 23-nation spring 2011 Pew Global Attitudes poll. The second was a special survey conducted only in Pakistan May 8-15, among 1,251 Pakistanis, following the May 2 killing of Osama bin Laden by the U.S. military. This second survey included a new set of questions specifically about bin Laden’s death and repeated nearly all of the questions from the first survey. The samples for both surveys cover approximately 85% of the Pakistani population.1 Throughout the report, results from the May survey are featured, although comparative data from the April survey are referenced on several questions of particular interest. 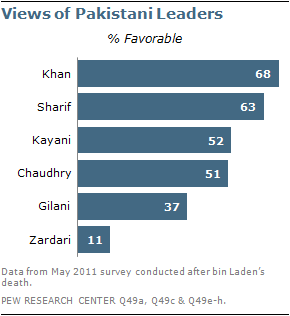 In general, there are few notable differences between the results of the first and second surveys, suggesting that the death of bin Laden had little impact on Pakistani public opinion about the U.S. or about other issues included on the survey. Key features of U.S. foreign policy remain unpopular in Pakistan. Only one-in-five think the U.S. considers Pakistani interests when making foreign policy decisions. 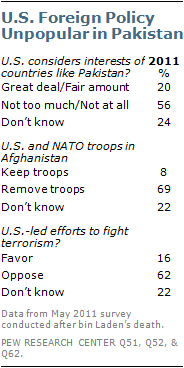 Almost seven-in-ten (69%) want U.S. and NATO troops out of neighboring Afghanistan. Roughly six-in-ten (62%) oppose U.S. anti-terrorism efforts. And beyond the opposition to the raid on bin Laden’s compound, there are other signs that Pakistanis are concerned about issues related to sovereignty and the use of American military force within their country’s borders. Among those who are aware of U.S. drone strikes against extremists in Pakistan, these attacks are widely seen as unnecessary and as too costly in terms of innocent lives. Fears about U.S. military power are widespread – 69% believe the U.S. could be a military threat to Pakistan. Pakistani views of traditional rival India have grown increasingly negative in recent years. Three-in-four express an unfavorable opinion of India, up from 50% five years ago. Pakistanis continue to be highly dissatisfied with conditions in their country. Roughly nine-in-ten (92%) are dissatisfied with the country’s direction. Almost as many (85%) say the economic situation in Pakistan is bad. And optimism is scarce – 60% think the economy will worsen in the next 12 months; only 13% believe it will improve. Pakistanis list a myriad of problems afflicting their nation – huge majorities say rising prices, a lack of jobs, crime, terrorism and political corruption are very big problems. Unsurprisingly, given these dismal assessments, ratings for President Asif Ali Zardari are overwhelmingly negative. Only 11% have a favorable view of him, down from 20% last year. His prime minister and fellow Pakistan Peoples Party (PPP) leader, Yousaf Raza Gilani, receives a positive rating from 37% – a significant drop from 59% in 2010. Opposition leader Nawaz Sharif fares better: 63% express a positive opinion of the Pakistan Muslim League (PML-N) leader, down from a year ago when 71% held this view. The most popular leader tested is former cricket star Imran Khan. Nearly seven-in-ten (68%) have a favorable view of the athlete turned politician, up from 52% in 2010. On balance, Pakistanis continue to view Chief Justice Iftikhar Muhammad Chaudhry positively, although his ratings have fallen somewhat since last year (51% favorable in 2011; 61% in 2010). Even though the Pakistani military has received some criticism since the U.S. raid that killed bin Laden, it remains overwhelmingly popular: 79% say it is having a good influence on the country. Ratings for military chief Gen. Ashfaq Parvez Kayani have remained on balance positive – 52% give him a favorable and 21% an unfavorable rating. 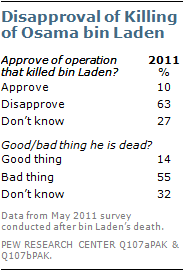 This represents a slight change from the April poll conducted prior to bin Laden’s death, when 57% rated him favorably and 18% unfavorably. In addition to the military, the media and religious leaders are also well-regarded; 76% of Pakistanis say the media are having a good influence on the way things are going in their country and 60% say the same about religious leaders. Few give the police and the national government positive ratings. Just 37% of Pakistanis say they followed news about the U.S. military raid that killed bin Laden very or somewhat closely, while 39% followed news about the raid not too closely or not at all closely. Most Pakistanis support the U.S. providing financial and humanitarian aid to areas where extremist groups operate, and many want the U.S. to provide intelligence and logistical support for Pakistani troops fighting extremists. Violence is the top concern among those who are worried about Islamic extremism in Pakistan; 40% say this, compared with 24% who are most concerned about the impact of extremism on the national economy, 16% who worry that it will lead to loss of freedoms, and 15% who fear extremism will divide the country. More than eight-in-ten (85%) Pakistanis say suicide bombing and other violent acts against civilians in defense of Islam are never justified. Far fewer (38%) said this was the case in 2002, when the Pew Research Center first asked this question.